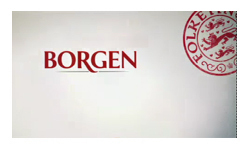 Borgen is a brilliant piece of television. It sounds stupid to say it out loud (or out-type) but due to my own narrow mindedness I’m always surprised to find all the quality that I’d expect from a major US production in a Danish show. But the question of whether I recommend it is a somewhat trickier one. One side of the argument is an enthusiastic positive, because it’s an absolutely wonderful series. Each episode is exquisitely well constructed with a good mixture of drama, character and humour, with elements of the stories gradually building throughout the series to create complex but utterly logical characters and plots. It looks fantastic, the acting is superb and I was completely obsessed with watching and discussing it every week, craving new episodes like an addict. But the counterpoint is that it’s a bit hard to recommend you watch something that will break your heart. I fell in love with the characters and the story from the very first episode. I described Birgitte as “a shining light… charming and funny, driven but insecure, a completely real human being”. But of course part of being a real human being is having the ability to screw up your life quite royally. By the end of the series she had turned into the slimy ‘normal’ politician that she ousted from power, trading her principles and her friends all to maintain power and control. As her spin doctor eventually pointed out, if her only aim is to stay in power, what does she want the power for? Meanwhile her home life suffered too and the wonderful relationship between Brigitte and her husband fell apart as her political life encroached further and further onto their life together as a family and his life independently. Watching everything fall apart was depressing, but completely credible. You can see why every decision is made and understand why Birgitte loses sight of what started out as so important. Maybe it felt a little rushed, but I think that was more due to watching two episodes a week and rushing through a year of political events in just five weeks. Analysing the ‘how’ and ‘why’ things broke down was fascinating, I passed probably almost as many hours trying to understand the balance between home, work and principles (for all the characters, not just Birgitte, the themes applied just as much to Katrine and Kasper) as I did watching the episodes. So don’t misunderstand me, my hesitation in recommending the series isn’t because it’s flawed, if anything it’s because it’s too good. It makes you care about the characters and see hope for better politicians, and then it breaks your heart. I wanted this to be a new West Wing, with battles won and lost but generally positive progress on the war. Borgen however started out full of hope and basically dashed that hope and made you feel a bit naive for dreaming in the first place. Excellent – yes, but also somewhat devastating.